This month we are showcasing the "Sunshine Birdies" stamp set that is exclusive for purchase only during March. You can get this stamp set for just $5 with a $50 purchase. View additional details regarding the campaign by clicking here. 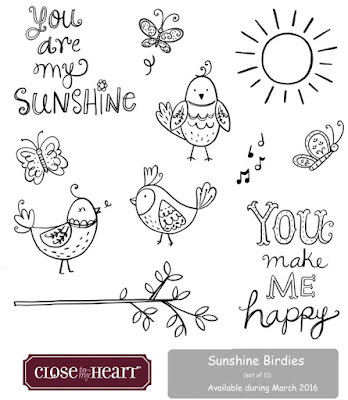 This stamp set has some fun springtime images and sentiments, perfect for bringing a smile to that special someone. 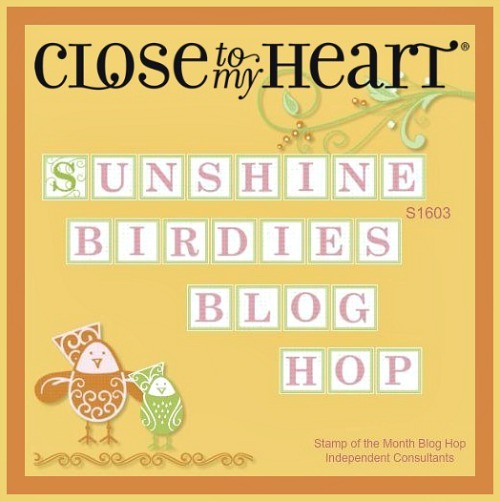 The stamp set is valued at $17.95. 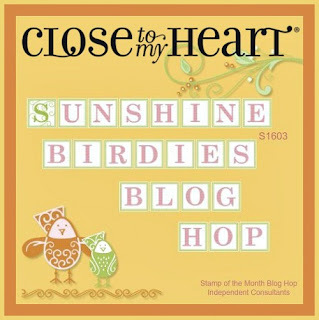 If you are coming from Michelle's Blog, you are on the right track. If you were to get lost along the way, you can find a complete list of participants by clicking here. 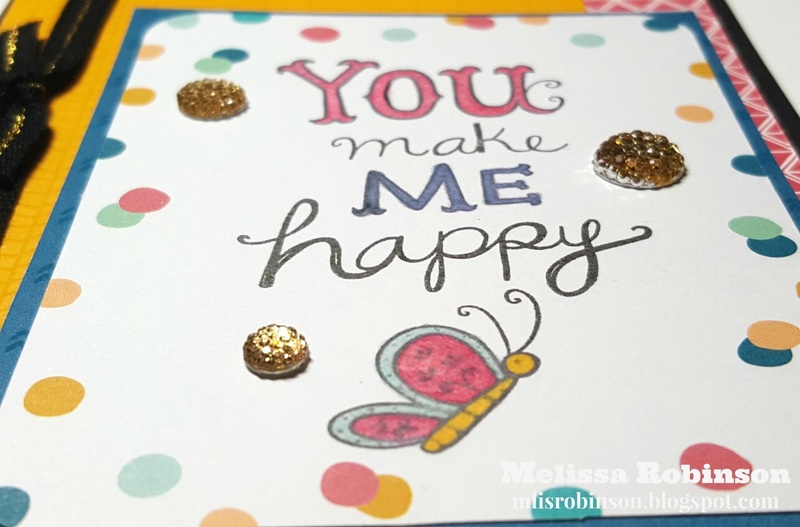 This card was kept simple by stamping the sentiment and butterfly image, adding a few layers of paper, three Bling Gold Gems, and Gold & Black Ribbon. 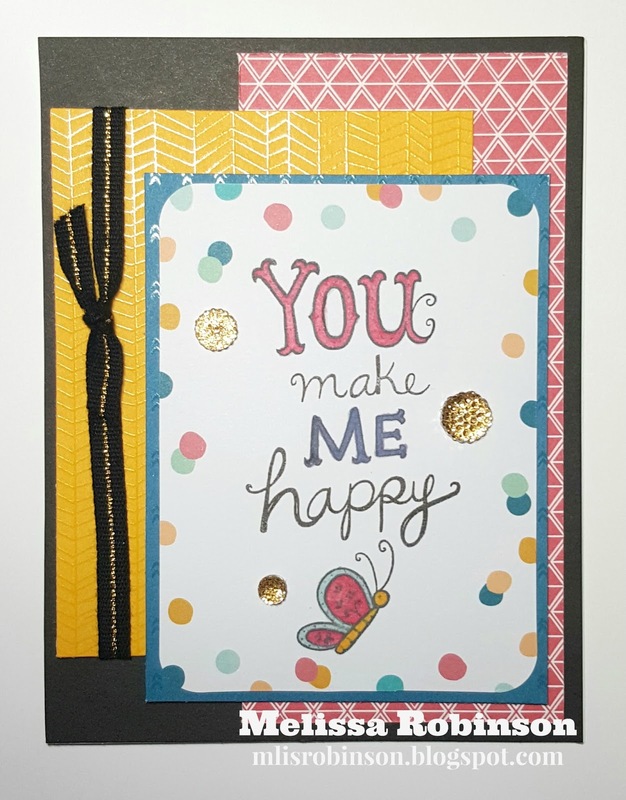 The polka dot focal point is one of the 3" x 4" Picture My Life Your Selfie Scrapbooking Program cards. Black ink was used to stamp the images and ShinHan Markers were used to color them in. The Hollyhock, Pacifica and Goldrush pieces of paper were pulled from the Fundamentals Adventure Paper Pack which contains a glossy side pattern on one of the sides. It is fun incorporating the PML cards to my artwork. It makes it so easy and I am glad I thought to just stamp the images and a few things to cutesy the card up a bit more. I hope you like it! Now head on over to Cat's Blog where she is sure to impress you with her creation. Great card! Love how you used the PML card. What a happy card! Great use of the PML card as well. I like the background too! The layers are great! Love how you paired the PML card!!! Love it paired with the PML card and fundamentals! Great card! 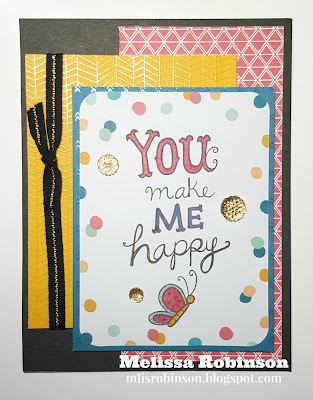 I was trying to figure out the paper pack and then I read it was a PML card - love that polka dotted card you used! Love this idea! Very colourful and attractive. Cute card. I love the PML card with this.